The one thing you can never accuse Spike Lee of is being bored. Even during a film like his remake Oldboy, which was nowhere near as impressive as the Korean original, Lee found a way to make it interesting despite it being a bad film. Blackkklansman may not be an amazing film but you can never accuse of it being dull. Simple premise. 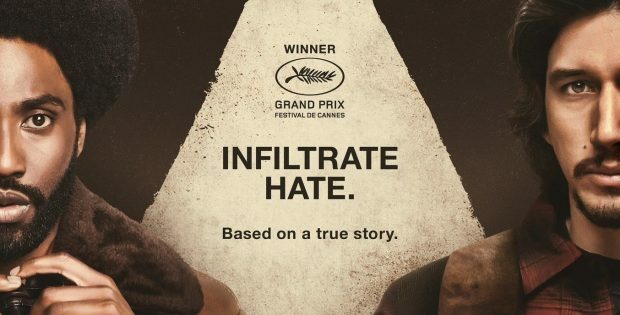 It’s the 1970s in Colorado and Ron Stallworth (John David Washington) infiltrates the Ku Klux Klan, led by the soon to be world famous David Duke. There’s only one problem: Ron’s an African-American and obviously wouldn’t be able to fit in. He’s teamed up with a Jewish cop (Adam Driver) to successfully infiltrate the Klan and prevent an act of domestic terrorism. It’s a true story, of course, that is everything good (and bad) about his films on occasion. He brings an amazing performance out of Washington and Driver, two actors with tons of talent, and gives us a villain who’s interesting on his own right. Topher Grace, still arguably most famous for playing Eric on That 70s Show, gives a genuinely engaging performance as the former gubernatorial candidate and former head of the KKK. This is an actor’s film and Spike Lee lets this trio bring out an amazing story that hasn’t been told before. It’s a terrific companion piece to a film like Get Out, from the same production company, for a back to back feature. Detroit, which has a similar motif, would be another good choice for that as well. There are a TON of extras on the blu-ray that gives you an insight into the film.